This past week I received a text asking if I wanted to go out on Lake Michigan to do some salmon fishing. You want me to pay someone to take me fishing?! I’ve always been the type to stretch my money as far as it can go. It’s not that I am cheap, but that I want to experience as many things as I can with the money I have. So to pay someone to take me fishing, at first, seemed crazy. Well my friends, I was thoroughly surprised yesterday. Saturday was a back to back homerun for me. Not only did I get a chance to fish with some great anglers and hook up with some kings, but I also got to test out a new fish grip product I’m coming out with. All the guys were helpful and put the grips to the test to see how they held up. I was unbelievably excited about our outing and barely slept the night before because I have never fished for fresh salmon. Seeing that I’ve only been fishing about 14 months, apparently I didn’t get the memo that salmon fishing is a lot of fun until it was almost too late. My first salmon experience was with the zombies in late fall 2011. I met up with fellow anglers including Sims and Nick around 4:15am to make our way to the harbor. We joined up with Captain Craig of ITO Fishing Charters and his first mate Dan. Within twenty minutes of passing the harbor mouth we had lines in the water and started marking fish almost immediately. The guys put me first in the rotation and the drag started screaming on one of the outriggers . Captain Craig handed me the rod and behind me I heard Nick yell, “reel down and pull up”. Well apparently you shouldn’t reel down past 10 o’clock because it allows too much slack in the line. Where was my rod? Roughly 7 o’clock and you guessed it…fish off. It was alright though. The guys told me it was probably a dink and that it happens all the time. (yeah right) I was given a forewarning to remove my cell phone from my pocket and I was going overboard. Another ten minutes passed by and the reels were screaming again. Having finished up batting practice I stepped up to the plate. This time I worked the rod slower and didn’t dare drop my tip below 10 o’clock for fear of losing another ‘dink’. I reeled 300 feet of line in and had my first king of the day. In the first hour the four of us had already hooked up. 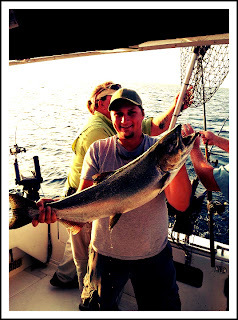 Nick brought in a nice Coho, Sims and Mark battled kings at the same time. Marks King was a beast and stayed hooked up for a good bit, pretty sure his catch was the biggest of the day. After round one Nick and I brought in two more fish, a lake trout and Nicks ticked off king. When Nick grabbed the rod he tightened down the drag and his line was still being ripped out. It was great to see such a good fight. The first run took out 50 feet of line and then he took a second run for a total of 80 feet on top of the 200 feet of line already out. It took about fifteen minutes but finally the landing net was in the water and we added another huge king to the cooler. At this time the wind completely died down, the sun turned on, and fishing got slow. We cruised our course for the next three hours while the radio chirped every couple minutes of other boats reporting that this was a bad day for fishing (I don’t think that even exists but whatever). While we weren’t tearing them out of the water during this time we had 5 strikes that we just couldn’t set the hook on fast enough. Optimism on the boat stayed high and we were having a good time regardless. Our captain and first mate weren’t your typical crew; they were like having two extra buddies on board. Finally, three hours later, the reels screamed again and Mark was on his second king of the day. Mark must’ve been good luck because every time he was on with a king a second reel would start buzzing. Sure enough Sims grabbed that second reel, cranked back, and battled in a huge female lake trout. In total we had 16 strikes, 8 of which made their way to the cooler, 6 hit and runs, and two lost (small dinks of course…yup, it was me that lost them both). It was nothing shy of an amazing day! ITO Fishing Charters was by far one of the best charters I’ve been on. The guys were more than helpful and really worked hard to make sure we landed our fish. I cannot wait for the next outing! Awesome day!! We used to take our old boat out on Lake Michigan and go Coho fishing all the time. What fun that was and then we'd take some of the fish to be smoked and some we'd take home and cook. Either way, yum! Great write up, Woz! I had a blast out there! In that video, you can see me just put down my right hand for a few seconds. That was one of the long runs that king of mine did. Did you eat any yet? I spent an hour cutting the big fillets into smaller steaks and individually wrapping them. I'll be eating tonight! Jenna helped me cure them last night after work I'm going to rinse and dry them overnight and get the smoker going on wednesday. I did eat the coho last night with a white sauce I found online. It was delicious! Looks like a heck of a trip! Maybe someday I'll get sent up that way at the right time of year?